If you’re one of the many people experiencing pain from an injury, you may be considering surgery to help reduce your symptoms. To help you with your surgery, you should consider both pre- and post-surgical rehab with an experienced physical therapy team. At Franklin Rehabilitation, our team is here to help you with all your pre- and post-surgical rehab requirements. Our goal is to get you back to the highest level of functionality as quickly as possible after your surgery. 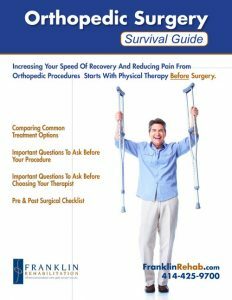 There are a variety of conditions that you may need surgery for, and our team at Franklin Rehabilitation can assist you with creating a pre- and post-surgical rehab program for many of them. One of the conditions that we can assist you in creating a rehab plan for is knee replacement surgery. Knee replacement surgery numbers increased by more than 60% between 1997 and 2004. An even greater worry is that these numbers have only continued to climb in the years since. Our team at Franklin Rehabilitation has helped many patients who’ve had knee replacement surgery. From all these patients, we’ve gained a wealth of experience. This experience allows us to help you form an effective rehab plan for your knee replacement surgery. Another common condition that our team can help you create a physical therapy plan for is a hip replacement. Much like knee replacement surgery numbers, the number of hip replacements also saw a drastic rise between the years of 1997 and 2004. There was an almost 50% increase in the number of people who needed this type of surgery during this period. The increase in hip replacements means that it’s another of the most common conditions that our team sees in pre- and post-surgical rehab. This is why we’re well-placed to assist you in recovering from your hip replacement surgery. Our goal at Franklin Rehabilitation is to help you create a pre- and post-surgical rehab plan that will have the greatest benefit for you. There’s a common misconception that physical therapy is only useful after surgery. However, there’s a reason why our service is called pre- and post-surgical rehab. Indeed, we can show you that attending pre-surgical physical therapy sessions can provide you with many benefits. One of the benefits of pre-surgical physical therapy sessions is that they may speed up your recovery after surgery. A second benefit it may have is that it may be able to reduce any pain that you’re experiencing from your condition before surgery. Also, pre-surgery therapy may help you to relieve anxiety you may be feeling before your surgery. Another benefit that this therapy may have is to help you become familiar with your therapy team. This way, you’ll feel more comfortable seeing them after your surgery is complete. Finally, pre-surgical therapy familiarizes you with the therapies you may be using after your surgery. With all these benefits of pre-surgery physical therapy, it’s easy to see why it’s such a vital part of pre- and post-surgical rehab. Our team at Franklin Rehabilitation can also help you with the post-surgery phase of your pre- and post-surgical rehab. By coming to see us for this part of your rehab program, you may be able to experience many benefits. These benefits will be on top of the ones you’ve already received from your pre-surgical rehab with us. One benefit of coming to us for your post-surgery rehab is you’ll already feel comfortable with our therapy team. This high level of comfort will help you feel more capable of doing post-surgery therapy. Additionally, you may spend less time recovering from surgery with this therapy. Another benefit of post-surgery rehab is that you’ll get a home therapy program to use as part of your rehab plan. This home therapy program may have several resulting benefits. First, it may allow you to shorten the amount of time that you spend in rehab. It’ll also let you spend more time performing helpful physical therapy exercises besides the time you spend in our office. Finally, it may allow you to reduce the number of office visits that you must attend during your rehab. You may be willing to consider rehab at Franklin Rehabilitation because of the post-surgery benefits alone. Combining the two forms of rehab into pre- and post-surgical rehab could increase the benefits for you. Download our Free Pre & Post Surgery Guide here.